BMW iNEXT Concept features automaker’s biggest-ever grille. The BEV will go into production in 2021, have a range of more than 400 miles and Level 3 autonomy and an interior that emphasizes riding more than driving. The ultimate driving machine ultimately wants drivers to relax and enjoy the ride rather than driving. 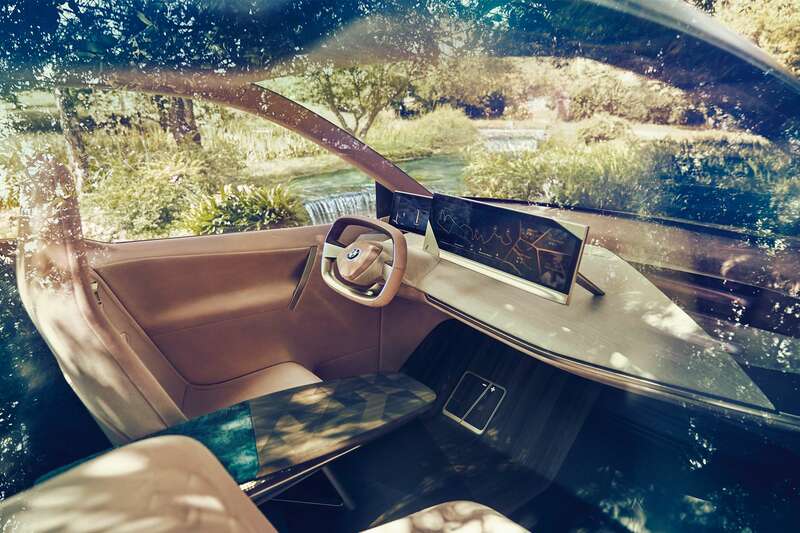 That’s the vision portrayed by BMW’s all-electric Vision iNEXT that made its world debut at the Los Angeles auto show last week. It also highlighted BMW’s belief that the vehicle’s interior will become increasingly important as we switch from being drivers to passengers. The cabin (see photo, below left) looks more like a lounge than a cockpit, with a banquette-style backseat and a minimalist dashboard. When in Boost mode, the steering wheel and displays point toward the driver, but in Ease mode the steering wheel retracts slightly, creating more space. Technologies BMW calls “Shy Tech” stay in the background and are deployed when needed or at the driver’s or passengers’ request. For example, occupants can draw a circle on the seat fabric to turn the volume level of the audio system up or down, and the upholstery glows in confirmation before fading out. The front features a whale-shark-like double-kidney grille, the largest BMW has ever produced, while the rest of the exterior borrows styling cues from the BMW i Vision Dynamics that debuted last year in Frankfurt. BMW is tight-lipped about the Vision iNEXT's battery-electric powertrain but notes it’s in line with the dozen EVs the automaker will have on sale by 2025. BMW spokesman Thomas Plucinsky confirms the iNEXT will go into production in 2021. Plucinsky also says the iNEXT BEV will have a range of up to 435 miles (700 km) and Level 3-plus autonomy. “It’s less about what the concept is and more about the building blocks that go into that and will transfer to the rest of the range,” he says. “The iNEXT project will provide us with building blocks for the future, benefiting the entire company and all its brands,” says Harald Krüger, chairman of the BMW board of management.